Architectural Pools is an authorized dealer for major fiberglass pool manufacturer, Barrier Reef Pools. Barrier Reef Pools was established in 1984 and has grown today to become the largest manufacturer of Fiberglass swimming pools in the Southern Hemisphere. It has an annual production of over 3500 pools. They are committed to providing premium quality pools while using the most superior products available. Their focus is steadfast in continuing to provide the very best product and service to the United States with fully integrated research, production and quality control. Architectural Pools can improve your lifestyle with one of the swimming pools from the beautiful Barrier Reef Range. Life can be pretty hectic these days, so take time off to enjoy your lifestyle more without leaving your home. The family barbecue takes on a whole new dimension with the addition of a family pool in the backyard. The Barrier Reef USA Range was designed to incorporate the best features of the versatile fiberglass swimming pool. Take your time to look closely at the modern styles, thoughtful interiors and safety features of some styles and convert your outdoor leisure area into something really special for the whole family. Abundant seating for entertainment or just plain relaxation after a hard day. Well designed entry and exit steps. Provision for spa areas and tables in some styles. Certain models designed deeper than most pools available. Dual entry and exit on some designs. Lowered handrails for children and elderly folk incorporated into some shapes - also great for water aerobics. Choice of 5 colors in beautiful shimmer colors. Many different sizes to suit your lifestyle. 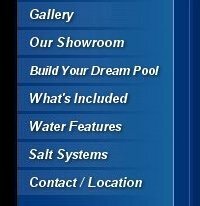 For more information about Barrier Reef Pools, visit their website.